Patriots that go out to protest these Islamic fundraisers would be better served if they have the individuals and groups from their local police chiefs/ local and state elected officials/ Jewish and Christian faith leaders/ who are on board with Islam. 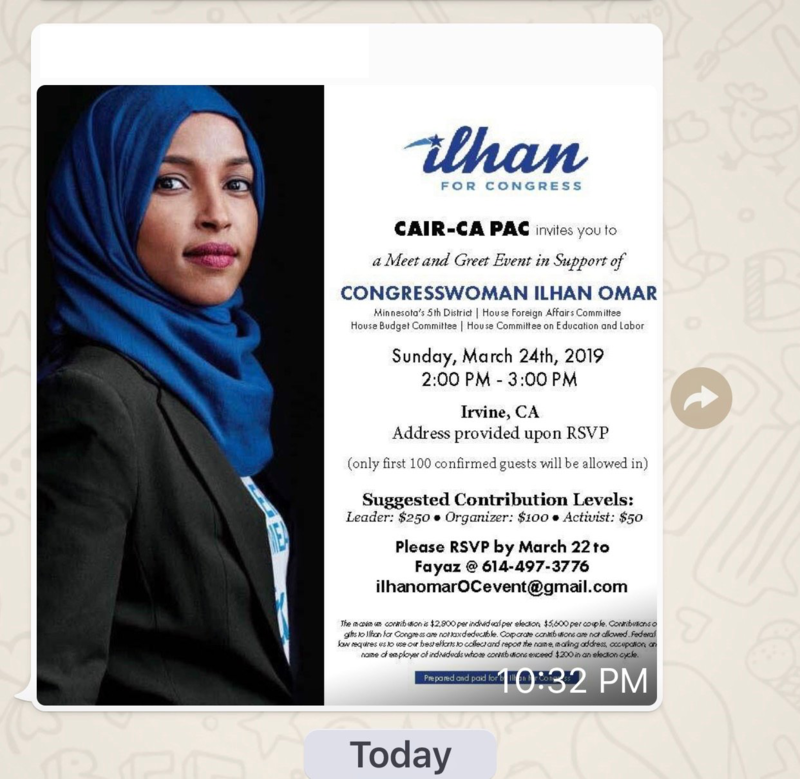 It appears those in attendance that are not Muslim should be identified for election purposes and also for Congregants of various non Muslim faiths who may not be aware of what their leaders associate with. Shamming these people is what must be a target as well. This is a matter of National Security and our agencies have gone alone to long without interrupting these terrorist Jihadist events. This is an out right dereliction of their job in politics! This should be grounds for censure and removal from said position! The day will come when all real American will regret not stopping these atrocities! Some patriots within the FBI oughta plunk down the $50, and clandestinely record these fundraisers of hers. Hopefully there’s somebody trustworthy that’ll be able to translate. IRUSA events are frequently closed because of the content – reported to be anti-Israel and anti-American. Why should Omar feel the need to be SECRETIVE about her acquaintances with members of Islamic terror groups? Our beloved George W Bush proudly and very publicly shared a stage in a DC Mosque with CAIR CEO Nihad Awad as smoldering bodies of Islam’s 9/11 Jihad attack were still buried in the WTC rubble. Without free speech, we aren’t free. I am opposed to those wanting to silence Ilhan Omar based on her anti-Semitic statements. Let her share her opinion, let’s encourage her to elaborate… hopefully at some point she will begin quoting Quranic scripture as being the basis and justification for her strongly held views of Jew hatred. Ok I will try later.